When I was four I was immensely into tracing paper. So much so my parents would perform this song-and-dance routine treating it as a big-ticket item burning a hole in their pocket. But I knew it wasn’t costing them an arm and a leg as they purported it to be. Tracing paper was cheap. Still is. But to their point, I’ll admit moderation wasn’t in my vocabulary. I use to chain-trace images with barely a breath in between. At my worst I was probably tracing two to three packs a day. My composure towards tracing paper was that of a rabid dog- fiercely scribbling the black line paths of Casper and Scooby-doo from coloring books left stark white from an absent of crayon wax. Those were my first memories of drawing and undoubtedly one of my first lessons. That being- know what you draw. A reliance on reference material is a common practice among illustrators and cartoonists but unfortunately misunderstood by fine artists. In fact my stint in art school was littered with lamenting fine artists who detested references to the point that it was a religion. The three issues not to bring up in art school were abortion, the death penalty, and using reference sources. Personally I felt the drama was unnecessary. Fine artists evoke inspiration from inside themselves and we, hedonistic miscreants, elicit inspiration from the carnal outside world. No hard feelings. To boot it was also a process taken lightly by art students, as I experienced first-hand in continuously harrowing critiques where a student, who plain as day spent forty-five minutes right before class haphazardly scribbling a potted sunflower on top of a corvette while a sun blared down on them from the corner of the page, tried to defend that their illustration does in fact correlate with the assignment’s subject matter- the overcrowding of America’s prison population (to note the sun and flower did have a smile drawn on. Yes both of them). And those that stayed on topic drew a prison cell consisting of a room with not a window in sight and an inmate holding bars shooting from floor to ceiling with no apparent door built into them. Both of these individuals drew based on their internal interpretation of a prison cell (or smiling sunflowers- which don’t exist) and not from an actual prison setting. 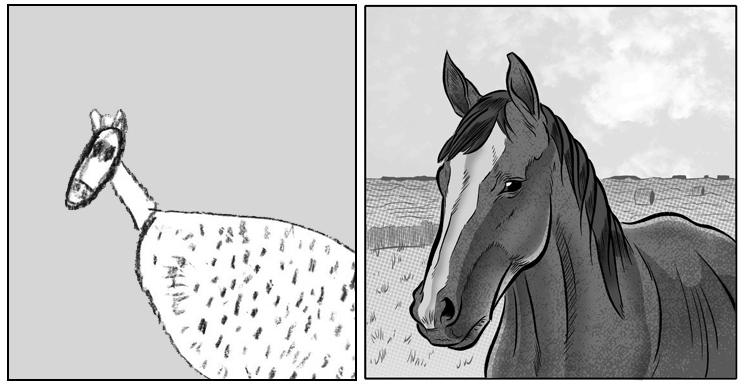 To illustrate this point, below on the left is a horse drawing done by memory. And next to it is a drawing I did of a horse with references to aid me. I know it’s tough to say which horse is better, but if you are the art director at Horse Illustrated and you’re hiring someone to draw you a horse for next month’s issue…..